"Always Room For One More"
"Found Room For Two More"
"Make Room For Three More"
This trilogy was 9 years in the making. Michael released "Always Room For One More" as a stand alone piece in 2007. Eight years later, Michael came up with a title for the second piece, "Found Room For Two More" and the creative idea evolved from there. In early 2016, Michael released the third and final instalment, "Make Room For Three More". Combined, the paintings took over a year of actual painting time to complete, and nearly a decade to be released! 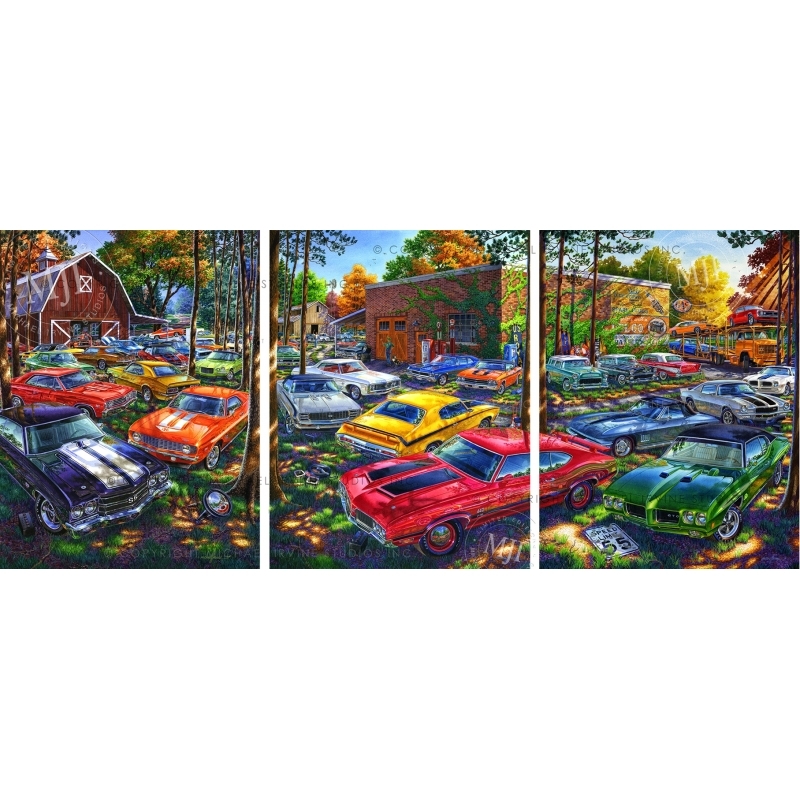 This incredible GM collector's dream set of paintings depicts over 45 big block beasts. Together, “Always Room For One More”, “Found Room For Two More” and “Make Room For Three More,” create one amazing scene — where one scene ends, the next begins — making this a stunning, highly collectible trilogy. Also available: Limited Edition Prints, Artist Proofs with Custom Remarque and Gallery Edition Canvases sold separately. Please visit each individual painting's webpage. ABOUT MICHAEL IRVINE'S REPRODUCTIONS All reproductions are individually hand-signed/hand-numbered by artist Michael Irvine • Accompanied by signed/numbered Certificate(s) of Authenticity • Limited Edition Prints and Artist Proofs are embossed with Michael's Studio Seal. Limited Edition Numbers Matching Set Each print 22" x 28" (Image size 18" x 24") - Limited to 800. 10pt satin finish, acid free, museum quality stock. 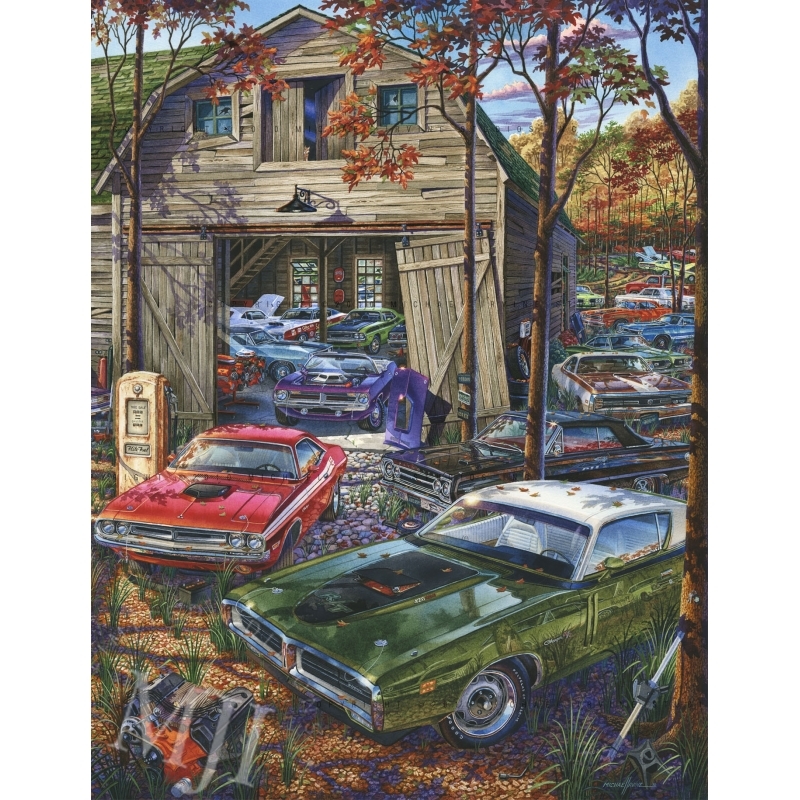 Artist Proof with Single Remarque—Numbers Matching Set Each AP 22" x 28" (Image size 18" x 24") - 20 total APs released. 10pt satin finish, acid free, museum quality stock. Remarque is "custom, done-to-order" in pencil or painted in watercolor (your choice). Call/email Linda to discuss your Remarque. Artist Proof with Double Remarques—Numbers Matching Set Each AP 22" x 28" (Image size 18" x 24") - 20 total APs released. 10pt satin finish, acid free, museum quality stock. Remarques are "custom, done-to-order" in pencil or painted in watercolor (your choice). Call/email Linda to discuss your Remarques. Gallery Edition Canvas (All the detail—twice the size) Numbers Matching Set Each canvas 36" x 46" creating 9 feet! Limited to 50. SOLD OUT. Personalized, Hand-Retouched Gallery Edition Artist Proof on Canvas Numbers Matching Set Each canvas 36" x 46" creating 9 feet! Limited to 5. SOLD OUT. Original Watercolor Painting Contact the Studio. If you have a special print/artist proof/canvas number request, please indicate it in the box below. We recommend 2-3 choices. Click SAVE REQUEST. After saving, please add it to your cart. If you forget to indicate your choice(s) here, or forget to save, you will have another opportunity to include additional information during check out. "They Came With The Farm Too"
"They Came With The Farm Free"
"Big Blocks Behind The Barn"
All images and content Copyright © 2019 Michael Irvine Studios Inc.
Write us. Call us. Email us.